Casino gambling has always been popular in Australia and online gambling laws have been quite loyal to Australian gamblers for many years. The federal laws were ambiguous allowing internet casino operators to offer interactive gambling services and take advantage of them. However recently, legislators paid their attention to the online casino industry since it proved to grow rapidly and be very profitable in the Land down under. The size of the gambling market in the country with the population of 24 million people is about $20 billion. Australians spend more on gambling than people anywhere else in the world. In 2015, a ‘Review of Illegal Offshore Wagering’ appeared and recommended lawmakers to adjust more strict regulations for the online gambling industry. The industry was governed by the 2001 Interactive Gambling Act which was passed in 2001 by the Australian Government in order to protect the Australians from the detrimental effects of online gambling. It banned online poker, roulette and blackjack but had some loopholes that online casino operators were exploiting. As a result, in November 2016 lawmakers introduced the Interactive Gambling Amendment Bill 2016 aimed to close the loopholes found in the Interactive Gambling Act. They introduced new legislation that requires online gambling operators active in the country to acquire local licenses or face heavy fines. According to this legislation, operators who take bets from Australian players without a local license will be deemed to have broken the law. Individuals face fines of up to AU$1.35 million per day, and companies will be charged AU$6.75 million. On 21 March, the Australian parliament approved that amendment bill. 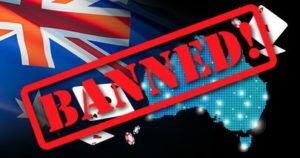 And now online casino gambling, live sports betting and online poker are considered illegal in Australia.